What Are the Benefits of Wheatgrass for Fertility? Wheatgrass is a popular supplement around the world due to its high levels of antioxidants, vitamins, minerals and chlorophyll. Wheat seeds are sprouted and clipped after about 10 days of growth, when their nutritional density is greatest, and then juiced or dried and powdered. In addition to supporting many health conditions, wheatgrass may help to improve human fertility. Consult with your doctor and a midwife before taking wheatgrass to make sure it is OK for you. Wheatgrass is used traditionally as a method of purifying the blood and tonifying the liver and kidneys for detoxification. According to Lani Lopez, naturopath and author of "Natural Health," detoxing the body before pregnancy can help to enhance fertility and promote a healthy pregnancy. Detoxification is recommended for both men and women as part of pre-natal care, as it balances internal organs and strengthens the body. Take wheatgrass supplements or wheatgrass juice every day before pregnancy to gently cleanse the blood and build up nutrition. Wheatgrass supplements or juice can naturally increase antioxidant levels, using organic nutrients to fight free radicals that may lower fertiliuty. Wheatgrass is an excellent source of nutritional antioxidants, including vitamin C, E, chlorophyll and trace amounts of beta-carotene and selenium. According to a review of research published in "The Cochrane Database of Systemic Reviews" in 2011, researchers from the University of Auckland in New Zealand investigated nearly 3000 couples to determine the effect of antioxidants on male fertility. The review found that men who took antioxidant supplements had a significantly higher pregnancy rate. No adverse reactions or side effects were associated with taking antioxidants, and researchers concluded that antioxidants were safe and beneficial for male fertility. Wheatgrass contains good levels of folic acid -- a B-vitamin vital for women during the time of conception. In a study published in "The Lancet" in 1991, researchers from the Medical Research Council investigated the effects of folic acid supplementation in early pregnancy. Taking folic acid at the time of conception was found to have a significant protective effect on foetuses, preventing neural tube defects such as spina bifida in up to 72 percent of cases. According to a nutritional analysis performed by Crop and Food Research New Zealand, wheatgrass contains 1130 mcg of folic acid per 100 g -- several times the recommended dosage of 400 mcg of supplemented folic acid for women attempting to conceive. Talk with your doctor before using wheatgrass as a source of folic acid for conception and pregnancy. Wheatgrass has not yet been investigated for its safety during pregnancy and breastfeeding. According to the American Cancer Society, wheatgrass is not recommended to be taken during pregnancy becuase of the risk of contamination with molds and bacteria from the soil. Wheatgrass is consumed as a raw green, and may contain pathogens that cause adverse reactions in some people. 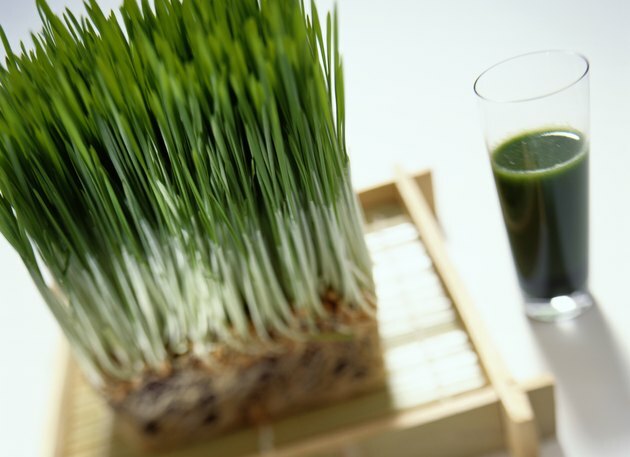 Consult with your doctor before consuming wheatgrass as a nutritional supplement.